Our lab has developed a microfluidics-assisted technique, the Cellular Capsule Technology (CCT) that enables to encapsulate cells and grow organoids or tumor models within a shell of porous hydrogel. The CCT is based on a co-extrusion micro-device fabricated with a 3D printer. The working principle consists in injecting an alginate solution and the cell suspension in concentric capillaries to generate a composite liquid jet. Exploiting the Rayleigh-Plateau instability that fragments the jet into microdroplets, we produce spherical capsules upon alginate crosslinking in a calcium bath. Inhibiting the Rayleigh-Plateau instability leads to the formation of tubular capsules. Quantitative imaging of the growth of the organoids using state-of-the art optical sectioning microscopy and analyzing the cellular fate using custom optofluidic devices allow us to investigate both fundamental mechanotransduction issues in stem cell biology and self-organization processes involved in tissue engineering, and to explore biomedical applications, in particular in oncology and neurodegenerative diseases. 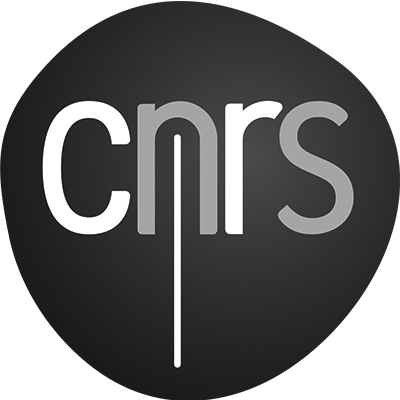 Part of our work is now transferred to industry through the creation of a start-up by two post-doctoral fellows. Cells self-organize in a spatio-temporal and context-dependent manner, leading to fascinating supracellular assemblies such as blood vessels, intestinal crypts, or embryos. Cells also sense mechanical cues from their surroundings and respond by altering their behavior or fate. Cell self-organization directs the architecture of a healthy or pathological tissue. Cell mechanotransduction is now recognized as an important regulator of many physiologic and pathologic processes. Our capsule technology allows us i/ to investigate the mechanisms of cell self-organization by using the capsules as micro-compartments or scaffolds for larger scale assembly, ii/ to study the mechanisms of mechanotransduction in 3D by using the elastic capsules as micro-dynamometers. We have shown that colon carcinoma cells encapsulated in alginate capsules exhibit enhanced motility in post-confluent stages of spheroid growth. Cells located at the periphery of pre-compressed spheroids are also more prone escape the spheroid upon implantation in a collagen matrix after capsule dissolution, indicating that compressive forces trigger a switch towards an invasive phenotype (collaboration: Danijela Vignjevic (PI), Institut Curie, Paris). The growth response (kinetics, cell density and proliferation mapping) was quantitatively modelled using an hybrid numerical approach based on a DCM (Deformable Cell Model) combined with a CBM (Center Based Model) (collaboration: Dirk Drasdo (PI) and Paul Van Liedekerke, INRIA BANG, Paris). We are investigating the influence of internally generated or externally applied mechanical stress on adipose growth. 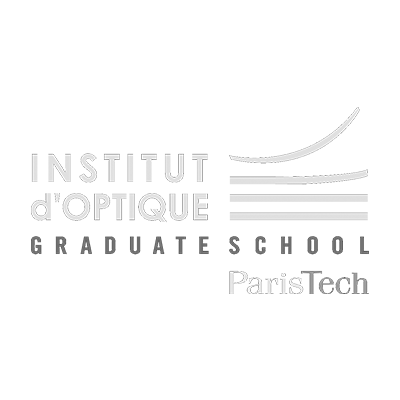 More specifically, we wish to decipher the molecular basis of adipose precursor cells mechanotransduction (collaboration: Eric Honoré – IPMC, Sophia Antipolis Nice). We have developed a strategy to engineer perfusable contractile mature vessels by directing the self-organization of endothelial and smooth muscle cells in hollow tubular capsules internally coated with extracellular matrix (collaboration: Andreas Bikfalvi (PI) and Laetitia Andrique (post-doc)- LAMC, Bordeaux). Hollow vesicular tissues of various sizes and shapes arise in biological organs such as ears, guts, hearts, brains and even entire organisms. We have developed an in-vitro experimental setup to generate encapsulated hollow tissue spheroids (cysts). We monitored their growth and spontaneous oscillations driven by between osmotic swelling and intermittent epithelium rupture. We have created a minimal theoretical framework to explain the timescales and amplitudes of the inflation-deflation cycles both in free and confined growth conditions. We propose that hydraulically-gated oscillations may be a general mechanism for organ size regulation (collaboration: L. Mahadevan (PI) and Teresa Ruiz (post-doc)- Harvard University). We are investigating the dynamic organization of stromal and tumor cells in spherical capsules as realistic tumor mimics. This approach is pursued for solid tumor (colon carcinoma in collaboration with Danijela Vignjevic (PI) and Fabien Bertillot (PhD student), Institut Curie, Paris) and for liquid tumors (follicular lymphoma in collaboration with Laurence Bresson-Bépoldin (PI), Simon Latour (PhD student), Valérie Lemorvan (IE)- Institut Bergonié, Bordeaux, and Pr. Karin Tarte -Faculté de médecine, Rennes). Illustrations: Fibroblasts spreading onto the surface of a tumor spheroid (left, credits Fabien Bertillot), B cells mixed with lymphoid stroma progenitors (right, credits: Simon Latour). The cellular capsules technology is used to produce micro-tumors and micro-tissues. For applications in oncology, 3D tumor spheroids have been shown to exhibit higher resistance to chemotherapy treatment than 2D cultures and thus better mimic in vivo tumor response. For applications in tissue-engineering, our general approach consists in encapsulating stem cells that are further differentiated in capsulo to produce ‘balls’ of specific tissue. Cell therapy for neurodegenerative diseases is a natural direction to go. There is growing evidence that 2D cell cultures fail to recapitulate the architecture and function of living tissues. Our microfluidic technique allows us to produce 3D cell-based assays in a controlled manner. Visualizing their growth and internal organization over days or weeks with subcellular resolution and reduced phototoxicity requires i/ to use or develop advanced optical sectioning microscopy, ii/ to design dedicated culture and observation environments, iii/ to perform quantitative 3D+time image analysis (using either our home-made microscopes or the Bordeaux Imaging Center facility ones). The Cellular Capsules Technology generates capsules at ultra-high rate (5000.sec-1). To exploit this massive production and to perform on-line cell fate monitoring for high throughput assays, we need to develop an optofluidic platform that integrates i/ fast label-free optical methods based on extinction measurements and light scattering and ii/ microfluidic cell sorting devices. The initial set-up relied on a co-extrusion chip mounted with glass capillaries and glue. We have now made the fabrication of the chip more accessible by using a stereolithography 3D printer and by adapting the design of the microfluidic circuitery. In addition, to reduce the occurrence of droplet coalescence, we have implemented a ring-shaped electrode that favors droplet splay and improve capsule monodispersity. 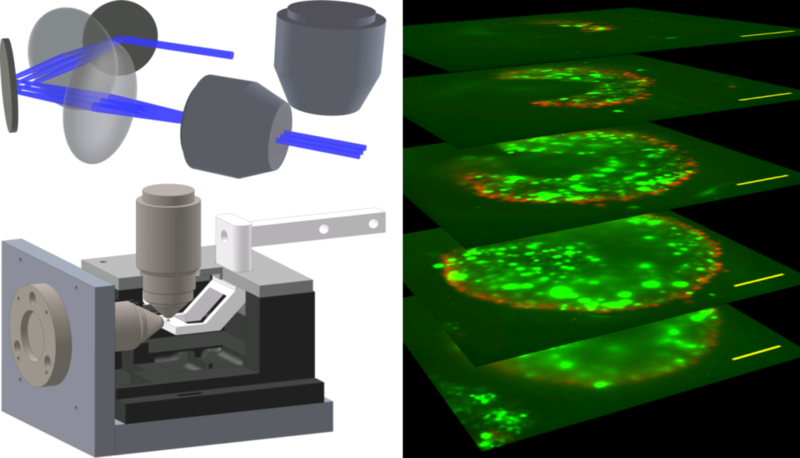 Implementation of light-sheet microscopy dedicated to long term stress-free spheroid imaging. We have set up a simple custom-made light sheet microscope to perform long term imaging in depth and with reduced phototoxicity. Due to the symmetry of the samples, dual-sided illumination and sample rotation are not necessary. We managed to avoid embedding the sample in agarose carrots. Instead, the capsules lie on an agarose mattress in constraint-free conditions. Angle scan allows to reduce stripe and shadowing effects. Besides the technology used to produce the capsules, the environment of the sample is an important aspect that needs to be optimized to perform proper visualization of the encapsulated micro-tissues. We have designed and validated a multi-usage observation chamber for live 3D imaging. The Universlide is assembled from 3D printed parts and compatible with all commercial microscopes. The chamber is applicable for medium/high throughput screening and automatized multi-position image acquisition. We developp in collaboration with Pierre Bon (permanent researcher, with Laurent Cognet) a calcium-analysis method that is automated and non-biaised. The software sequentially process mathematical operations to provide the variations calcium signalling (or any other fluorescence intensity fluctuations) within a single cell. We are currently improving the bêta-version and making proofs-of-principle on different biological systems. While 3D optical microscopy techniques allow us to visualize and monitor with great details the fate and internal cellular architecture of encapsulated organoids, they are intrinsically slow. To perform fast and automated analytical assay, we need to design image-free methods and to integrate the detection module into a microfluidic chip. In the first step towards building such an optofluidic platform, we develop an analyser based on light extinction measurements. This approach does not require cell labelling and allows to monitor cell viability and cell differentiation with good statistics. The BiOf lab has developed the Cellular Capsule Technology, which enables the alginate-encapsulation of multicellular spheroids. 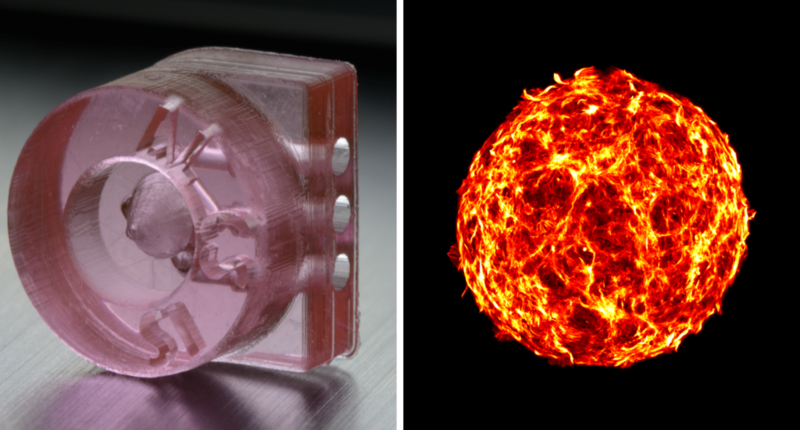 Our optofluidic devices allow producing efficiently stem cell spheroids, tissue cysts (cystic 3D cell cultures), and various 3D tumor models, including liquid tumor organoids.  The experience of our academic research team, based in Bordeaux, France, in self-assembled 3D cell culture and tissue engineering has led us to explore cell mechanics and cellular mechanotransduction, design novel 3D cell-based assays using fluorescence light-sheet microscopy and investigate novel therapeutic strategies, such as the use of dopaminergic neuronal organoids as a new parkinson’s disease cell therapy.